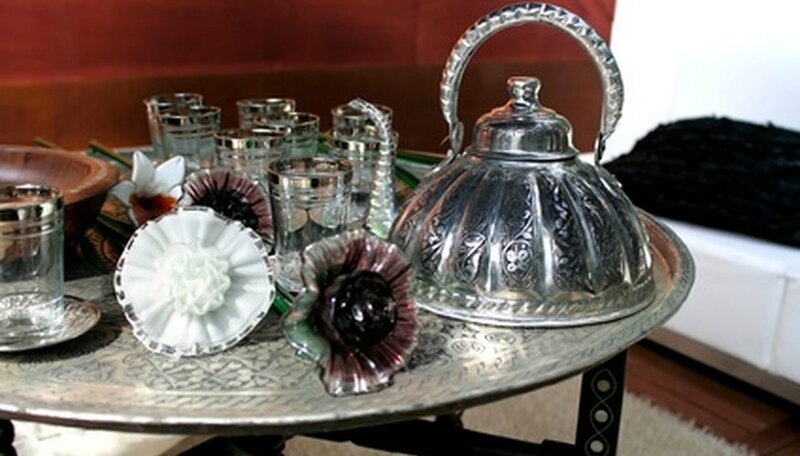 Knowing how to remove silver plating from items like jewelry or flatware is useful if you want to strip off old, weathered silver as a first step toward replating the item with new silver. You can also use it as a way of recovering precious silver from items you intend to throw away. Both the application and removal of silver plating to other metal objects--typically copper--are dangerous processes that involve toxic chemicals and acids. These chemicals are caustic to skin and eyes and toxic when inhaled, so before attempting to carry out this process yourself you must ensure that you have eye protection, no exposed skin, and can vent fumes completely and immediately to outside air. Wear proper safety items. Full-coverage goggles to protect your eyes from splash back are a must. Wear an old rain coat or other impermeable material to protect your arms, dishwasher or other impermeable gloves on your hands, and a plastic apron to protect the rest of your body from any splashes. Mix a solution of 3 parts sulphuric acid to 1 part nitric acid in a porcelain or stoneware container. Place the container in a larger pot filled with water; this is a water bath. Heat the water in the water bath with a burner until the acids in the container reaches a temperature of about 176 degrees F.
Tie a copper wire around the object you'd like to remove the silver plating from. Suspend the object by the wire in the acid solution. Remove the item to be desilvered after a few seconds. Rinse thoroughly in water of any temperature, then roll it in sawdust to dry. Combining and heating these acids is extremely dangerous. Always wear safety goggles and ensure thorough venting of fumes directly to outside air--failure to do so may kill you. Mulrooney, Marie. "How to Remove Silver Plating." Sciencing, https://sciencing.com/remove-silver-plating-4898690.html. 24 April 2017.